Our photo booth was a HIT at our wedding!! All of our guests LOVED it. It was great to have them there, especially because not all of the guests liked to dance, so they had some other type of entertainment for the night being able to get in the photo booth! They have a huge supply of props, their crew was so much fun to work with and the photos printed out quickly and were of great quality! Thank you Smiley Photo Booth for making my day so much fun! Thank you! Happy to offer our services. Smiley Photo Booth was one of the best choices we made for our wedding. They were incredibly professional and easy to work with. We made a few special requests, like asking to remove monitor from the outside of the booth, and they had no problems making the changes for us. We were also able to supply our own design for the side of the photo strips, which worked nicely with all of the other design work we'd done. The attendants did a fantastic job too. All in all, we're very happy. Thanks, Smiley Photo Booth! Smiley Photo Booth was the highlight of our party! Marc and Phyllis were a pleasure to work with. You can tell they love what they do and enjoy seeing their customers have fun! They offer the most affordable pricing and still give you many options with the packages! They had a large selection of great props that were clean and looked brand new. I’m so happy I chose this vendor! Thanks for the nice comments, we do enjoy our work and we are very proud of our product. It's all non stop laughs, smiles and big fun the whole time, so much fun! 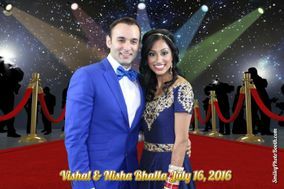 Our guests had a blast at our wedding thanks to Smiley Photo Booth! They had so many fun props and an amazing staff that were very friendly and helpful! I just want to thank you again for a truly wonderful experience! You guys were fantastic and everyone LOVED the photo booth! This is definitely an amazing photo booth with high quality 4x6 pictures and tons of space and tons props! I loved how everyone in the booth received a picture as well! You've got a great business and can tell how passionate you are about it. Thank you so much! This company was AMAZING!!!! I would highly recommend it to anyone looking for a fun filled time with many memories to look back on. While planning my wedding a friend of mine found them on the Internet, after calling and speaking with the owner I was convinced this would be a great vendor that my guests would all love. Although there are many photo booth company's out there now days, this company by far has to be the best bang for your buck!!! The booth was huge and allowed for large groups of people to take pics all together. The props were amazing and there was such a great selection! And to top it all off the staff were so kind and polite! I have to say this made my entire wedding and the guests absolutely loved it!!! Everyone at our wedding LOVED the Smiley Photo Booth. They brought tons of props, and made sure guests signed the photo book as they exited the booth. They were fantastic to work with and I would (and do) recommend them to anyone! They was amazing, fun and all the pictures from the photo booth was amazing.. My wedding was ten times more memorable because of them.. That not the best part their prices was perfect.. I was on a budget and they worked with us.. If you want an amazing friendly photos booth pick them you won't be sorry. Smiley Photo booth was the best! Plenty of options for backrounds- they even included some that I didn't think of that were more popular than my choices!